On a list of all things terrifying, I imagine watching your daughter dance, as if possessed by some unknown entity, to the theme from Halloween, while standing in front of a Mike Myers life-size doll, is a high ranker. 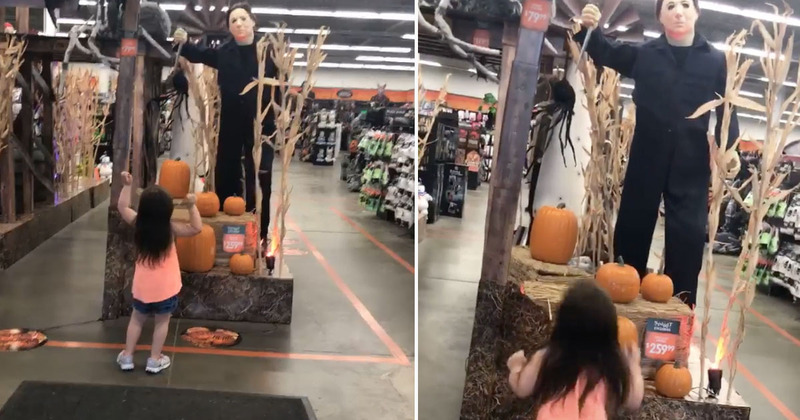 What was intended to be just a short visit ended up taking a little while longer when Jaymi’s daughter fell under the spell of the Mike Myers doll, doing nothing else but dancing in front of it. 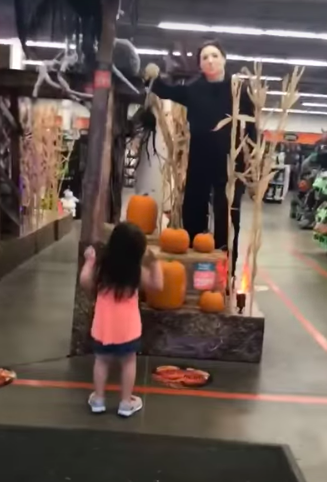 Almost like a tribal ritual, the little girl was caught in a seemingly like trance, which, while it may be funny and kind of cute, it’s also absolutely terrifying. We were at the Halloween store on the way to a Chuck E. Cheese. My daughter ran into the Spirit store and instantly fell in love with all the scary interesting things. She didn’t want to leave when she discovered the Mike Myers attraction, so we danced to his song and I recorded it because I thought it was too funny. Some say the little girl is still dancing. Some say at night, when Jaymi thinks she’s tucked up in bed, her eyes open and she walks alone to the Halloween store and dances in front of Mike. While you may watch the video and just laugh it off. ‘Aw cute kid, so funny lmao’ or maybe ‘Ha! My kids do the same thing lol’. What’s probably worth making note of is The Mike Myers Curse. The Mike Myers Curse took place in the small township of Middletown, Bethlehem, PA, just a short trip from Doylestown, coincidentally. It was winter, 1979. A harsh winter if ever there was one. Ask anyone from Middletown about 1979 and they’ll reply with two words: ‘very cold’. But the winter wasn’t the most worrying thing that year, The Mike Myers Curse was. The story goes, to celebrate the release of Halloween the year before, thousands of life-size Mike Myers dolls were created, before being taken out to thousands of different VCR rental stores, cinemas, fancy dress places – you know the score. One of the dolls was taken to Drew Melden’s Funhouse – a fancy dress store just off the main street in Middletown. Life was quiet in the town in 1979 and the doll became quite the local celebrity, bringing a lot of attention to Old Man Melden’s Funhouse. Families went to see the doll, kids were fascinated and terrified by it, teenagers would run up to the store at night and spook each other out in front of the doll. What I’m trying to say is – everybody knew about the doll. But Old Man Melden’s time on this earth was up and he died in quite horrific circumstances. I won’t go into detail. Due to the high popularity of Melden’s Funhouse, people were waiting out for him to open on the morning after his death and when he didn’t come down to open up, the townsfolk knew something was wrong. Town legend, Burly Joe Thornton was the first to break down the door and a number of other men came with him inside where they found the body. But while police were carrying out the standard procedures they noticed something strange. Yes. Something very strange indeed. The Mike Myer’s doll was gone. An overwhelming sense of dread was cast over the town’s people. Local news at the time reported it very formally – you can still find the articles online – they reported Melden’s death and said some things were missing in the home, suggesting it was a burglary gone wrong. Yet locals believe something much darker happened. It was no secret Old Man Melden was involved with dark magic and a lot of people believe he’d conducted a spell of sorts to ensure immediately after death, his spirit would be transported into his beloved Mike Myers doll. Whatever happened, the doll was spotted numerous times in east PA, often waiting by the side of the road at night, posing as a hitchhiker. Countless people went missing – men, women, and children – between ’79 and 1990 when the disappearances mysteriously ceased. Is this the latest sighting? Probably not because this entire story is fictitious and only exists to boost my word count.